Marketing/Branding/Social Media/Advertising/Promotion – Business: Engaged! I’m in a band with my husband and three friends. We’re a newer band but we’ve grown into serious musicians with a high level of work ethic. We started playing outside the garage sixteen months ago. We’ve learned a lot in the last year — things like working as a team, building a following (because most bars aren’t really hiring a band; they are hiring a crowd), and choosing the right songs. Playing out has given us great insights. Our band’s brand and playlist are well-defined and we like each other. No unnecessary drama; just rock and roll. Our band is finally starting to really connect with our gut instinct. We’ve filled our calendar with appearances at any place that would give us a chance. We’ve played a good number of venues and events. With just six weekends left to book for this year, we can start to be choosy. One of the most important lessons that gelled for me this last weekend was one I learned many years ago in my business: it pays to ask the right questions. Here’s what drove the lesson home for me. We returned to play at a bar this last weekend that was one of our first gigs. It was a tough experience the first time, mostly because we were new to everything: the setup of the venue, most of our songs, the need to make sure you get paid before you walk out at the end of the night, and bar manager expectations. The bar manager voiced her disappointment that we didn’t have many of our own following at that first gig. Remember that I said a bar isn’t hiring a band, they are hiring a following. Since that is important to have a following, we waited for a year to go back. The thing to remember about a following is that there are different reasons people come out to see your band. Some wait for an appearance at a venue close to them. Some won’t go to a smoky bar. Some have prior commitments on the nights you play. Some only come to an early show. . This isn’t something you have to worry about when you play a private party. I haven’t figured out what that ideal follower number is where we can schedule a show and count on thirty or more people to come to our show just to see us. I’m sure there is a tipping point too where suddenly you start racking up the followers. I’m looking forward to that day for sure. Putting on a great show with short breaks so people stay in the bar longer. The bar manager has hired us back. We are booked for two dates but she tells us that we better have a following if we’re going to get the second date. Last weekend was the first date. We did a great show. We were prepared. We promoted the show heavily to our following. We had a successful setup. We had great comments and interaction from the customers. The customers stayed for two or more sets. We reminded customers about upcoming bands and events at the bar. The servers had a stellar night for tips too. Most of those results usually mean more bottom line revenue, but I don’t know those final numbers. I checked in with the bar manager later in the evening to see how she thought things were going. She wanted to know where our following was. Didn’t we have one? She could only see four people who were not her regular customers. I knew we had a few more people say they were coming who didn’t. That was typical. And frankly, I expected her to have a few more customers of her own too. because I didn’t ask the right questions. I really needed the work. After I asked some questions, I realized that her only success objective was whether new customers came into her bar. She measured nothing else. She expected us to bring in enough new people to clear our fee in $5 cover charges because her regulars weren’t enough to do that. Needless to say, we didn’t meet her expectations. We regard our relationships with our bar managers as a mutually beneficial business arrangement. I’ve done a good job of asking questions about how things went at the end of the night. However, my husband handles most of our booking. He’s the initial point of contact for our venues and event planners. His questions involve fees, dates, and times. He’s never asked about their objectives, but I bet he will from now on. We knew that she expected a following. If he had asked enough questions, we would have realized that she expected to pay our fee with the revenue from cover charges. We would have known that our typical five to ten followers were not going to make up for her lack of regular customers. If we had asked what bands normally bring the most people, we would have realized that she has a far bigger regular crowd with a country band. We should have asked what she planned to do to promote our appearance. We would have discovered she wouldn’t do anything. With these important details, we could determine that we would fail to meet her objectives. In essence, we weren’t a fit for her establishment and should have turned down the invitation to play. The last thing we want is an unhappy customer. We offered to release the next date with her so she can bring in another band whose following is likely to come to her bar. She accepted our offer. There’s a month so hopefully we fill our open date with a bar that is a better fit. She has a good chance at finding another band. We’ve already turned down several offers for that weekend in past months because we were booked. Unfortunately, there are far more great bands than bars here. I’m not certain that we’ll fill the date unless another band cancels at a venue we normally play. My business is ten years old this month. I learned to ask the right questions in the first few years. The answers I received when I asked the right questions told me about client objectives and whether I could meet them. I learned what I needed to make on a job to pay the bills and make it worth my time. I also learned how to change unrealistic expectations if possible. If not, I learned how to decline politely or refer them to someone who was a better fit. I’ve had a lot of tough experiences because I didn’t ask the right questions. I’ve also had some temporary angst when I turned something away, especially at a time when I really needed the work. But time after time, customers either came back with realistic expectations or I was approached by a suitable customer that I could serve well. Lesson learned then. Lesson learned now with the band. 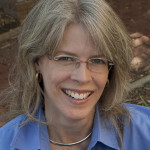 Carrie Perrien Smith MBA is a training, communication, and publishing industry veteran. Since running screaming from her corporate training and communications career over eleven years ago, she’s not only become a speaker but runs a professional speaker bureau and a publishing company that primarily serves the needs of speakers who write and writers who speak. She is also the host of Business: Engaged! radio show for business owners on Blogtalkradio. Her most recent book is called Currency: Striking Networking Gold in a Relationship Economy. 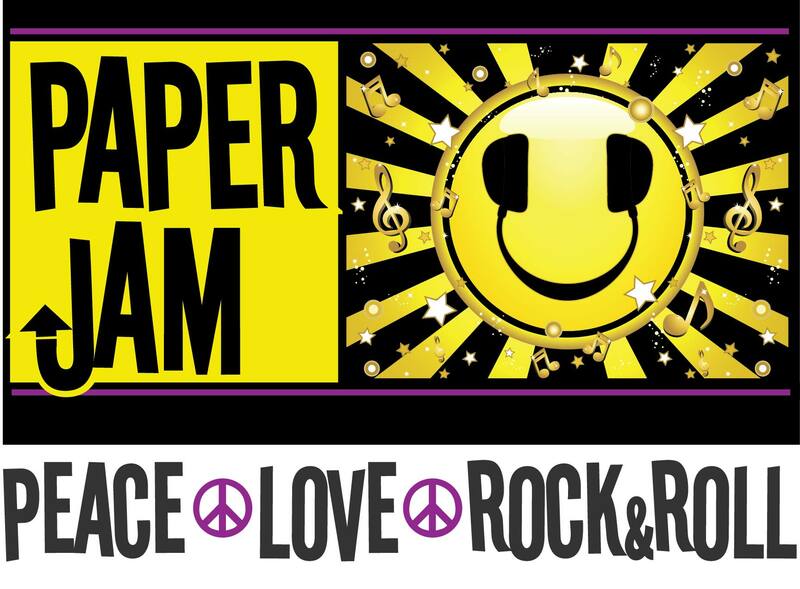 If her free time, she is a community activist, home improvement junkie, and singer in a party band called Paper Jam. You can learn more about Carrie and her company, Soar with Eagles at www.soarhigher.com. We have more tools than ever to attract and engage potential customers. Business: Engaged! 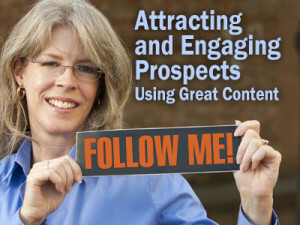 host Carrie Perrien Smith gives you strategies for using these new tools to build a database of prospects and produce enticing, informative content about your business. We have more tools than ever to attract and engage potential customers. But these new tools require you to produce enticing and informative content about your business. In this episode of Business: Engaged!, I’ll give you methods for attracting your target customer to your website and building your prospect database. You’ll get ideas for great articles and social media updates that engage customers. And don’t worry if you aren’t a writer; you’ll get some tips for creating different types of content and finding writing help. We also talk with Jack Pate, Manager of Social and Digital Media for Tyson Foods. We’ll talk about Vine, the new video application that is Twitter’s new companion. 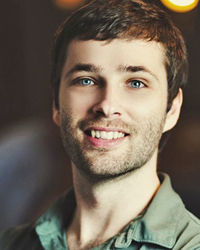 Plus he’ll share wisdom he’s gained over his years of experience in online marketing. You can follow Jack on Twitter at @arkansas. And last week, I talked about my new book project. I’ll share my process for writing the book and give you updates on my progress over the coming weeks. Perhaps it will inspire you to write your own book. This week, I talk about determining my target reader/buyer and brainstorming the topics I’ll cover in the book. I talk about the Federal Trade Commission’s CAN SPAM Act. Click here to watch the video on the FTC website and learn more so you can do the right thing. Episode airs Saturday, March 23 at 8:00 a.m. CST. I got the rare treat of sitting in the guest chair today with Denise Griffitts on her Your Partner in Success Radio show. I interviewed her a few weeks ago on working with virtual assistants (click here to listen to that interview). We both support clients in the speaking industry so we thought this would be a great topic for her show. The topic was geared toward professionals who want to go out on their own as speakers, trainers, or consultants. It was also good information for any professional who wants to promote their business It is especially good for someone who wants to raise awareness for themselves because they are considering launching a job search. And the truth is that speaking and writing can be an additional stream of revenue. Learn how to create a lasting and profitable connection with your customers and prospects using today’s social media tools. Host Carrie Perrien Smith welcomes Ted Rubin, co-author of Return on Relationship to Business: Engaged! How is your relationship with your customers and prospects? Do you know what they are saying about you? Do today’s digital media users find you easy to connect with? Is your investment in your company’s social media really paying off? After this episode of Business: Engaged!, you’ll never look at your company’s social media presence the same again. 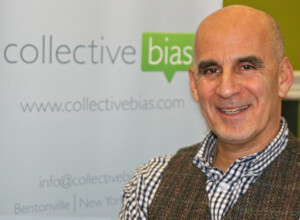 We are talking with Ted Rubin, co-author of Return on Relationship and Chief Social Media Officer for Collective Bias, a social shopper media company. Ted is going to share what he’s learned working in the field of social media marketing. Most important, he is sharing the principles you need to know to connect to your customers in a meaningful way and create fans for your company’s brand. In his industry, they are called brand evangelists and advocates. And you’ll also learn more about brand influencers and ambassadors. Click here to learn more about Ted Rubin. You can also follow him on Twitter at @tedrubin. In fact, you can find him on all the major social media sites. Click here to learn more about Collective Bias. I also found some precious planning time this week and I’m going to share how I approached that an announce my new book writing project. Episode airs Friday, March 15 at 9:30 a.m. CST. I’m also doing a radio show interview on Your Partner in Success Radio with Denise Griffitts on March 15 at 11:00 am CST. We’ll be talking about creating a brand. Click here to listen to the show’s episode anytime. Is It Time for a Virtual Assistant? It is time you retained a virtual assistant? 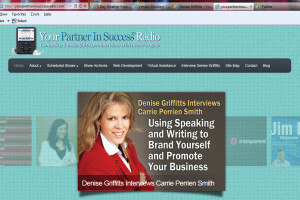 Virtual assistance industry expert Denise Griffitts joins host Carrie Perrien Smith on Business: Engaged! She’ll talk about how VAs assist clients and even share insights for aspiring VAs. Sometimes a business owner needs a little help but can’t justify the expense of an extra employee. Other times, he might need some specialized help that he can’t get locally. Today, many business owners are turning to the services of a virtual assistant. And as the industry is evolving, VAs who offer more extensive services are becoming known as online business managers or OBMs.In this episode of Business: Engaged!, we talk with Denise Griffitts. She is a nationally recognized virtual assistance industry expert, online business manager (OBM), thought leader, coach and mentor. She is the founder and CEO of Your Office On The Web and Your Virtual Assistant. She’ll talk about what a virtual assistant can do for you and how to find one. She’ll even share insights for those who might want to become virtual assistants. Click here to learn more about Denise Griffitts’ company. 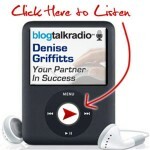 Click here to listen to Denise’s Your Partner in SuccessTM radio show on Blogtalkradio.com. And who hasn’t burned a bag of microwave popcorn at the office? I exploded a bag in our microwave, and what I was left with was a smelly, yellow microwave. I’ll share how I got rid of the smell. Ken Abernathy joins Carrie Perrien Smith on Business: Engaged! to share his insights about making the most of your trade show booth investment. Trade shows can be the best way to prospect leads that end in sales or they can be a king-sized waste of time and money. It all depends on your strategy for meeting your objectives. On this episode of Business: Engaged! we talk with Ken Abernathy, president of Big Hats Consulting. He has over 25 years of experience serving customers who exhibit in trade shows and expos domestically and internationally. We talk about how to get the most out of the investment, what to expect when working with different shows, and the current trends in trade show booth design. And you won’t want to miss my thirteenth update on my city council campaign in Rogers, Arkansas. It was election week and you’ll want to know what happened. To keep up with my campaign, you can visit my blog at www.carrie4rogers.com. Click here to listen to this episode. You can sign up to receive our e-mail newsletter Business: Engaged! Direct so you’ll be the first to know when we post a new show. Click here to our list of past episodes. And don’t forget to connect with us on Twitter at @businessengaged and Facebook (just search for “Business Engaged”). We love it when you tell others about the show so take a minute and post this link for your Facebook friends or Twitter followers. Michael Phelps joins Carrie Perrien Smith on Business: Engaged! to share tips for using LinkedIn for business development. You probably have a LinkedIn profile but you might know how powerful it is as a business tool. On this episode of Business: Engaged! we talk with Michael Phelps of In-Direct Information. He’s an expert on using LinkedIn to its fullest capacity for prospecting, relationship building, and job searching. We also feature Courthouse Concepts on our product and service spotlight. You’ll learn more about their pre-employment screen services. And you won’t want to miss my eleventh update on my city council campaign in Rogers, Arkansas. This week’s update is about out-preparing the competition. To keep up with my campaign, you can visit my blog at www.carrie4rogers.com. Carrie Perrien Smith, author of Currency: Striking Networking Gold in a Relationship Economy talks about networking on this episode of Business: Engaged. She interviews a group of networkers to gather their favorite networking tips. What is your favorite networking tip? I went on location to my favorite networking group and asked that question. Check in with Business: Engaged! to hear what they had to say. We also highlight Legal Shield’s business plan on our product and service spotlight. They have two levels of business plans that you’ll find useful. You know well that when you have employees, at some point you’ll have legal questions. And you won’t want to miss my tenth update on my city council campaign in Rogers, Arkansas. This week’s update is about out-preparing the competition. To keep up with my campaign, you can visit my blog at www.carrie4rogers.com. Josh Clemence talks about the issues that businesses deal with when they sell on the internet on this episode of Business: Engaged! One of the great, still largely unexplored frontiers for traditional local businesses is the internet. How do we sell what we do to a wider market? In this episode of Business: Engaged!, we welcome back Josh Clemence of Acumen Brands. We talk about where some of their web properties got their start and what makes them successful. We also explore the issues that today’s internet-savvy companies are dealing with. To learn more about Acumen Brands, visit their website at www.acumenholdings.com. We also highlight Legal Shield, formerly branded as Prepaid Legal Services. This Ada, Oklahoma company provides personal and business legal services through an affordably priced membership program. And you won’t want to miss my ninth update on my city council campaign in Rogers, Arkansas. This week’s update is about out-preparing the competition. To keep up with my campaign, you can visit my blog at www.carrie4rogers.com. Barbara Taylor talks about business valuation in this episode of Business: Engaged! 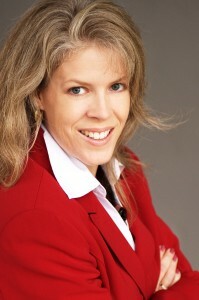 To learn more about Barbara and her company, visit http://synergybiznwa.com. Check in also for the eighth update on my city council campaign in Rogers, Arkansas. This week’s update is about creating top-of-mind awareness. To keep up with my campaign, you can visit my blog at www.carrie4rogers.com.